1. Concealed back zipper, V-neck, sleeveless, high waist. 2. Asymmetrical,irregular hemline for a stunning look. 3. Breathable, soft and elastic lace floral fabric with lining. 5. 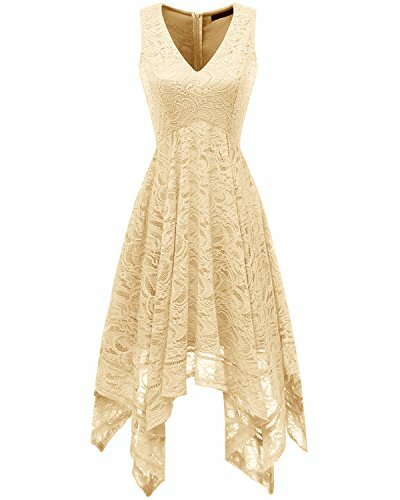 Cute and comfortable style makes this dress perfect for any outing: cocktail, daily, causal, wedding, party, summer concerts, beach, formaland semi-formal occasions. Note: Please allow 1-2 cm / 0.4"-0.8" differs due to manual measurement, thanks. * Due to the difference between different monitors, the color of the actual item may vary slightly from the product images above. * Our size chart is DIFFERENT from Amazon's, please refer to our size chart before purchasing. * Slight hand wash in cold water and hang dry. * Many solid colors for your selection. If you have any questions about this product by Bridesmay, contact us by completing and submitting the form below. If you are looking for a specif part number, please include it with your message.